Every so often, I try to appeal to statists by explaining to them that it’s not in their self interest to steal too much. Why? Because if you kill off the geese that lay the golden eggs, what will you do tomorrow when nobody is left to produce? Heck, even the former leftist President of Brazil understood that there can’t be any redistribution if there’s no production. I’ve made this point by sharing a very clever cartoon. I’ve made this point on television. And I’ve tried to explain it using simple analysis. 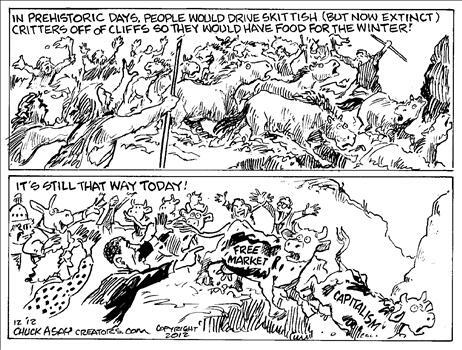 I’m not sure I’ve been overly successful, but perhaps this Chuck Asay cartoon will help get the point across. The cartoon is akin to the fable of the ant and the grasshopper. But the “modern” version of the story, featuring coerced redistribution that causes the ant to no longer be productive. Heck, it’s also what we see in the PC version of The Little Red Hen. And the same theme can be found in the amusing anecdote that uses beer to explain the corrosive impact of a “progressive” tax system. The moral of the story – in every case – is that you shouldn’t be too greedy if you’re living off others. In my speeches, I often joke that a tick or a flea is in trouble if it’s feasting on a dog that dies. Well, on a more serious note, this can happen to countries. 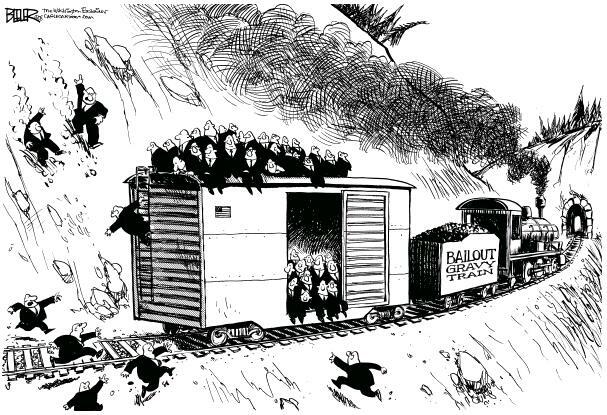 Greece is in deep trouble because there are too many people riding in the wagon and not enough people pulling the wagon. We’re not there yet, but I don’t like the trend. I have a serious question for readers. What’s worse, bailouts for government or bailouts for the private sector? Yes, both are bad, but is it worse to bail out a bankrupt entitlement program, such as Social Security, or it is worse to bail out an industry, such as the financial sector? To bail out the housing sector, or to bail out Medicare? Fannie and Freddie, or GM and Chrysler? All these examples involve huge amounts of money, and both private-sector and public-sector bailouts have perverse long-run effects, but which is worse? And don’t forget there are lots of other bailouts in our future, as discussed on this interview for Fox Business News. The interview took place before Christmas, but the topic is even more relevant today since the budget season is about to begin. Most of the discussion was about government agencies and programs that may get more handouts, though bailouts for the Federal Housing Administration and the Pension Benefit Guaranty Corporation would be indirect bailouts for big business and housing. So we’d get the worst of all worlds, more government spending and more cronyism. Or, as they call it in Washington, a win-win situation. But I call it legal corruption.